Hi friends ! Bottle gourd, also called lauki / Ghiya or /doodhi, is a vegetable that is probably known in India for its delicious preparations. 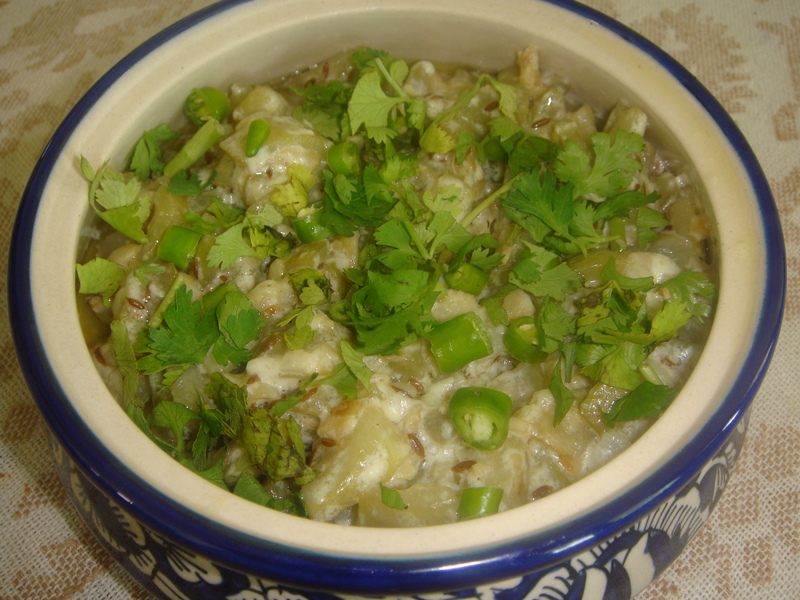 Here is a simple, easy to cook and delicious recipe of lauki / ghiya/ bottle gourd / Doodhi . You will try it once, it will remain on your party menu for ever! Heat the oil in a wok / kadahi and add the jeera, when jeera begins to splutter, add the cut Lauki pieces , salt and stir continuously over high flame, till the Lauki cubes looks a bit glossy. Cover and cook on low flame till lauki is tender, stirring in between a few times. Add the cream, ground cashew nuts mix well and cook for two minutes more, till well blended. Serve hot garnished with, black pepper powder, chopped green chilies, coriander leaves with any Indian bread of choice! Great for weight loss :Bottle gourd is one of the best foods you can have if you want to lose weight as it is 96% water, and a 100g serving contains as little as 12 calories. The high fibre content will take care of your hunger, and keep you feeling full. Helps treat urinary disorders: Bottle gourd has a cooling effect on your body, and a glass of bottle gourd juice is a great diuretic that can be used to treat burning sensation while passing urine. This burning sensation is caused due to high levels of acid in the urine, which can be countered by the alkaline nature of bottle gourd juice. Reduces stress: It is quite easy to feel stressed in today’s times, and unhealthy eating can only worsen the situation. Bottle gourd has a high water content has a cooling effect on your body which makes you feel better the very moment you take it. It also has diuretic, sedative and antibilious properties which makes your body feel better internally, and keeps stress at bay. Warning: Even though, bottle gourd is really good for your health, it can sometimes be bad. Bottle gourd juice that tastes bitter can seriously damage your digestive health according to a study published in Indian Journal of Gastroenterology in 2011.